I ought to be talking about how Ryan Braun will sit out the rest of the season. Heck, I haven’t even mentioned the thing about Brandon Phillips complaining that the team misled him about his last contract yet. But I am just too eager to see what last night’s line-score will look like in this post. Sort of like a social security number, I imagine. The Reds thoroughly trounced the defending champion San Francisco Giants in the wee hours of the Pacific Time Zone last night, 11-0. They scored in each of the first seven innings. In fact, since they also scored in the ninth inning of the last game before the All-Star break, I guess that’s 8 innings in a row, with an extremely long rest in the middle. 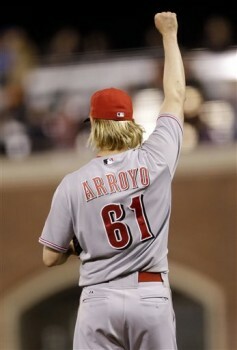 Bronson Arroyo would normally get more attention for a complete game shutout. He allowed 7 hits through 9.0 innings. He even struck out 6. The offense is harder to summarize. Devin Mesoraco, Shin-Soo Choo, and Jay Bruce each hit home runs early on to account for three of the runs, but Todd Frazier contributed the most RBI with 3. 11 different guys had hits, and 6 different guys had RBI. Joey Votto struck out twice. Go figure. The win brings the Reds’ record to 56-43, and brings a certain sense of catharsis to Reds fans, even those who didn’t stay up till 1 a.m. to see it finish. They play a traditional double-header tonight to make up a rain-out that happened the last time the Giants were in town. Tony Cingrani (LHP, 3-1, 3.23 ERA) will pitch the first game against Eric Surkamp (LHP, 0-0, -.– ERA) who has just returned from Tommy John surgery. First pitch at 7:05 p.m.
Greg Reynolds (RHP, 0-0, -.– ERA) is slated to pitch the second game for the Reds against Barry Zito (LHP, 4-7, 4.88 ERA). Zito is 4-1 with a 2.45 ERA when he is the home team pitcher, but though today’s game will happen in AT&T park, the Reds will actually be the home team. First pitch will be 30-minutes after the completion of the previous game, probably around 10 p.m.